NHTSA’s new Car Seat Finder Tool is targeted towards helping parents choose the right car seat or booster seat for their child. The campaign urges everyone to realize the importance of registering car seats in order to receive important safety recall notifications. While this may seem shocking, every 34 seconds a child under the age of 13 is involved in an auto accident, and more than a third of children killed in these crashes were not in car seats or wearing seat belts. NHTSA pushed manufacturers to recall seats with defective buckles in 2014 to ensure owners received a replacement buckle at no cost. Because of this effort, more than 7.4 million car seats have been recalled. 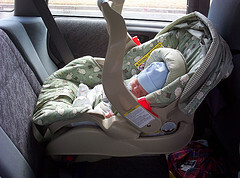 However, on average, only 40 percent of people get their car seat fixed. That’s where NHTSA’s “Don’t Delay. Register Your Car Seat Today” campaign comes into play, urging caregivers to register their car seat so manufacturers know how to notify them of a recall and how to receive the free fix. NHTSA’s Parent Central site allows parents and caregivers to find their manufacturer or brand of car seat so that they can be directly linked to the manufacturer’s registration page. Set a good example for all children in your car and always wear your seat belt. It is more common to see unrestrained children in a car with unbuckled drivers, so keep that in mind when travelling any distance. NHTSA’s Safercar mobile app can be downloaded for Apple devices and Android devices. Regardless of the size or type of vehicle you have, the age of your child or the duration of your car trip, children should always be properly restrained. When properly installed and used, car seats, booster seats and seat belts can save lives. If you or your child has been injured in an auto accident in Crystal River, Inverness or the surrounding areas, please call a Citrus County Auto Accident Lawyer at Whittel & Melton today at 352-726-0078 or contact us online for a free consultation.